Summer heat is well underway in June in warm parts of the country. That means many of us in warm climates have already shifted our watering habits to conserve moisture. 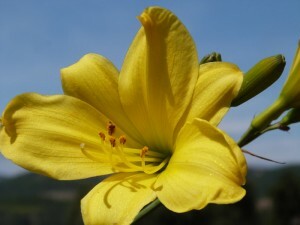 Gardening in June is the time to plant heat-hardy annuals and perennials if you haven’t already. It’s also the time when many heat-loving edibles begin to shine. Did you know? June is also Perennial Gardening Month; a great time to focus on low-water usage and easy-care landscape plants. Add heat-hardy summer color to containers and the landscape. Plant purslane, coreopsis, sedum, celosia, marigolds and more. Zinnias, cosmos and marigolds grow easily by seed in the sun garden. Blooming perennials that will thrive in the heat include Russian sage, penstemon, coneflower, Daylily ‘Yangtze’, and the dramatic Tecoma ‘Orange Jubilee’ (pictured). Plant vibrant tropicals such as mandevilla, hibiscus, bougainvillea, ixora, plumeria, palms, and croton. Grow what you eat! It’s easy to direct sow beans, carrots, corn, squash, melons, and pumpkins right now in the landscape or in raised vegetable beds. Add transplants of peppers, squash, eggplant and cucumbers. Don’t forget to plant plenty of herbs in containers and even your ornamental beds. Rosemary, chives, thyme, basil and oregano are beautiful and useful. Irrigation: Depending on where you live, your water restrictions could be fairly extreme. Be sure you understand the times and days you are allowed to water. Remember that plants and lawns prefer less frequent, but deep watering, rather than small amounts of water each day. Deeply watered plants grow stronger roots. If you have an automatic sprinkler system, have it checked for broken heads, hose leaks and other potential problems by a licensed irrigation specialist. Add mulch to all garden beds to keep roots cool, conserve water, suppress weeds and give the landscape a finished look. 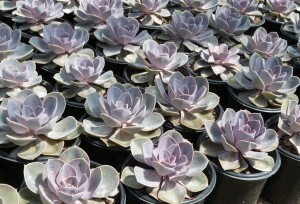 Fertilize: Now is the time to feed sedum, succulents and cactus. Use a cactus fertilizer or all purpose liquid feed diluted by ¼. Keep all landscape plants healthy through summer by feeding all perennials, annuals, roses, ornamental grasses, lawns, shrubs and trees with a balanced fertilizer. If you’ve planted bougainvillea, watch out for bougainvillea looper. This caterpillar causes unsightly, severely scalloped leaves. Treat with organic spinosad or Bt. Whiteflies and spider mites love summer heat and stressed plants. Look for them on the undersides of foliage on shrubs, perennials and edible plants. Using water-wise plants, and providing consistent moisture, will help to naturally prevent these pests. Plants that are properly watered, fed and planted in the right sun requirement are less susceptible to pests and diseases. Horticultural oils and insecticidal soaps can be used as treatments. Great plants for June Gardening at T-Y Nursery!